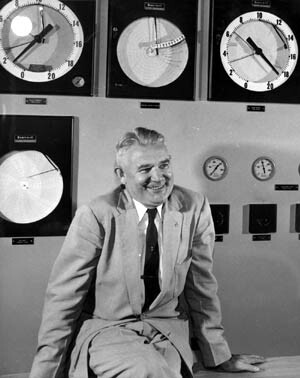 February 6, 1905: Samuel S. Baxter was born in Philadelphia.Sam Baxter was the long-time Commissioner of the Philadelphia Water Department. “With the exception of military service during World War II, Sam Baxter spent his entire life living and working in Philadelphia. He was born in the city on February 6, 1905, attended public school, and graduated from high school in January 1921, just before his sixteenth birthday. He obtained a job with a sporting goods firm, but spent his evenings at Drexel Institute (now Drexel University) studying municipal engineering. One of his instructors was Thomas Buckley (APWA President, 1937), who was a senior engineer for the city. Buckley encouraged Baxter to take a civil service examination for a surveying position, and the young man became a chainman in a district field office in February 1923. Thus began a 49-year career of service to the city of Philadelphia…. The City’s largest treatment plant in the far northeastern part of the City was named after him. Commentary: Sam Baxter is the man who convinced me that public service, especially serving customers safe drinking water, was one of the highest callings an engineer could have. In a town that was slimed with patronage and dirty politics he was special. He had the highest moral principles and he told any Mayor that tried to control him where he could go—in the most gentlemanly fashion. I met him at a seminar at Columbia University for senior engineering students. Here was the guy running the Philadelphia Water Department taking an entire day off to hang out with undergraduates. He intrigued me. I decided to write a senior project paper on wastewater reuse. That’s right, sewage to drinking water. I took a chance and asked Mr. Baxter (that’s what everyone called him; never “Commissioner”) if I could interview him. He agreed and was very kind to a kid who knew nothing about nothing having to do with wastewater reuse. In the course of my two interviews with him, I was impressed with him as a man and as a leader of this field of water and wastewater services. When the time came to choose among my job offers, I accepted a position with the Research and Development Unit of the Philadelphia Water Department. I owe him a lot. I will never forget what he did for me and for the drinking water community. This entry was posted in Year 7 TDIWH and tagged drinking water, honesty, Philadelphia Water Department, Samuel S. Baxter, wastewater reuse, water, water history, water professional on February 6, 2019 by safedrinkingwaterdotcom.